Levees guard one of the Delta’s many twisting, turning channels. The Bay-Delta Conservation Plan, addressing the region’s problems, is to be released in draft form next month. Bay-Delta Conservation Plan (BDCP) public review has been delayed again with release of draft documents now scheduled to take place December 13. Release of the public draft was postponed last month because of the recent partial federal government shutdown that resulted from a Congressional budget impasse. That followed an earlier delay announced in September. 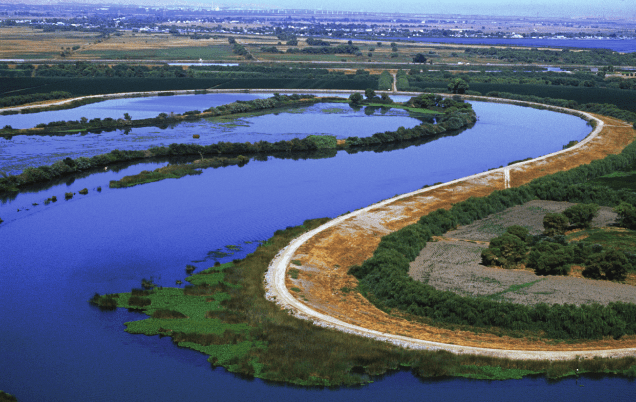 The BDCP includes Governor Brown’s proposals for twin tunnels to bypass the environmentally troubled Delta, its endangered species and fragile levees in order to convey water destined for export to users along the San Joaquin Valley’s West Side, in Southern California and in parts of the Central Coast and San Francisco Bay Area. One hundred twenty days of formal review of the public draft BDCP and its related state and federal environmental impact report and statements will be launched with the release. There will be plenty for those interested to read. The documents are expected to total 25,000 pages. The Friant Water Authority and its member agencies are among the interested parties, even though little Delta water directly reaches the Friant service area. Friant’s basic Central Valley Project water supply is diverted from the San Joaquin River at Friant Dam and has its origin in the Sierra Nevada. Those diversions, however, are made possible by federal government delivery of a substitute supply from the Delta that is delivered through the Delta-Mendota Canal to four West Side entities – the San Joaquin River Exchange Contractors – that hold historic river water rights. CVP water is also delivered into the Friant Division’s southern end for direct delivery and use through exchange with eight agencies located along the Friant-Kern Canal that hold Cross Valley Canal water service contracts with the U.S. Bureau of Reclamation. The Friant Water Authority supports the BDCP’s concepts in recognition of the necessity of eliminating or easing Delta water supply problems for the 26 million California residents and more than 3 million acres of farmland that rely upon water exported from the Delta. However, since those benefiting from Delta water supplies are going to be expected to pay for the $25 billion cost of the twin bypass tunnels and related conveyance facilities, Friant officials for months have been trying to discover any BDCP benefits to users of the Friant-Kern and Madera canals. So far, none have been found. That’s because the Exchange Contractors effectively enjoy the first right to use CVP water from the Delta as a substitute for their historic San Joaquin River supplies. Even without release, the BDCP and its twin tunnels plan have been generating debate and controversy. The dispute continued after state officials in August announced a change in plans to reduce by 50% the tunnels’ total permanent footprints and shift portions of the project away from some homes and farms. The two main water conveyance tunnels would each be five miles shorter, down to 30 miles from south of Sacramento to federal and state water export pumping plants northwest of Tracy. Operational changes have been made in plans at the request of federal biologists. When the review period begins, documents will be available online, in repositories throughout the state or through request for review. A series of public meetings will be conducted during January and February to provide information about the project and accept formal comments. Formal written comments on the Public Review Draft BDCP and EIR/EIS will be accepted during the official comment period and all significant environmental issues raised in comments received during the public review period will be addressed in the final EIR/EIS, officials said. Details on how to provide comments will be available in December.